May in the mountains begins to bring the summer residents back up to their cabins. Dirt and his crew are out raking yards and picking up branches strewn about in the winter winds. The local Hardware store is brimming with customers asking questions like: “where can I find one of these?” as they hold up a rusty pilot burner or a pipe elbow. The parking lots are lined with pallets towering with bags of top soil, cow manure and mulch. Meanwhile, many of the natives that work seasonally are just thrilled to have a paycheck again. We dream of gardens, warm clear nights and afternoons at the river with the kids. As of this writing, the maintenance folks on the Blue Ridge Parkway have completed their work on the tunnel at Craggy Gardens and have begun work on the long rock bridge at Linville Falls. One of the Parkway’s largest stone arch bridges and built by the WPA in the 30’s, it boasts three spans of 80 feet each. Their work should be completed by May 30th, just in time for Memorial Day weekend. In the kitchen here at the Café, we’ve added 2 new salads to our 2016 menu. A Chopped Chef Salad with all the traditional meats, cheeses and boiled local eggs, tossed with Honey Mustard Dressing. But we also added a Kale Salad with roasted Butternut Squash (Yummm!) toasted Almonds, Bleu Cheese, Parmesan and tomatoes and tossed with Lora’s own Lemon Tahini dressing. We’ve found Kale to be a surprisingly wonderful food for us to enjoy. Versatile and tasty, it’s a painless way to enjoy food that’s rich in vitamins A,K and C, Fiber and the B vitamin Folate. Our Wednesday Casseroles have become more popular than ever! So much so we have decided to expand that offering to Fridays evenings this summer. Beginning Friday May 20th we will be offering BBQ packages for pick-up. These are pre-ordered just like the Wednesday offering, for pick-up Friday evening between 4:30 and 6:00pm. There will be 3 package options to choose from. See our facebook page for details, or you can go to our website at switzerlandcafe.com and sign up for our e-mail announcements. 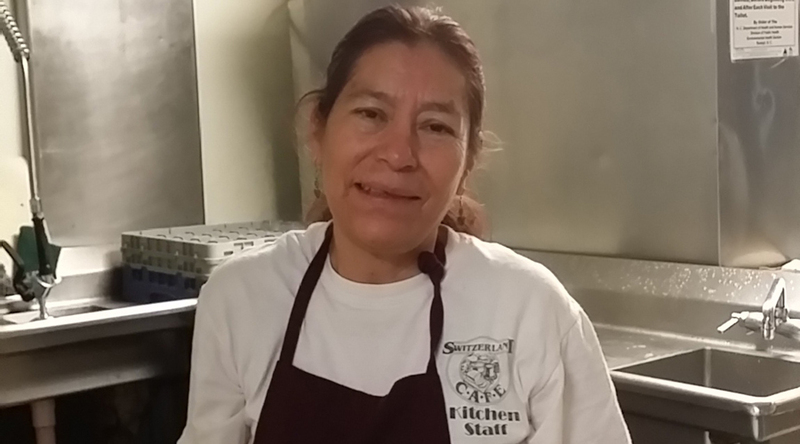 Everybody’s pretty happy that our Dishwasher Cecilia has gained her US citizenship. She’s 59 years old, has mothered 5 children and instilled in every one of them a strong work ethic that sometimes leaves me in awe. Swollen hands?, “No problema.”, A broken down car?, “Part of life.” That’s Cecilia. She would work 7 days a week if we would allow her. I find her to be one of my heroes. Many of our staff from last season have returned for another year. Janet, Amanda and Justin are out front and Ms. Ann is in the back with her sister Amanda and Cecilia. We’ve also got some new faces with Juli and Maddie. This week, we’re all headed together to Asheville Thursday night for an Asheville Tourists Game. It’s all about baseball for sure. And beer. No really it’s not about the beer. Yes it is. Anyway, we’re all here and excited about creating and serving great meals for you this summer. Plan your mini vacation today and stop by and see us!